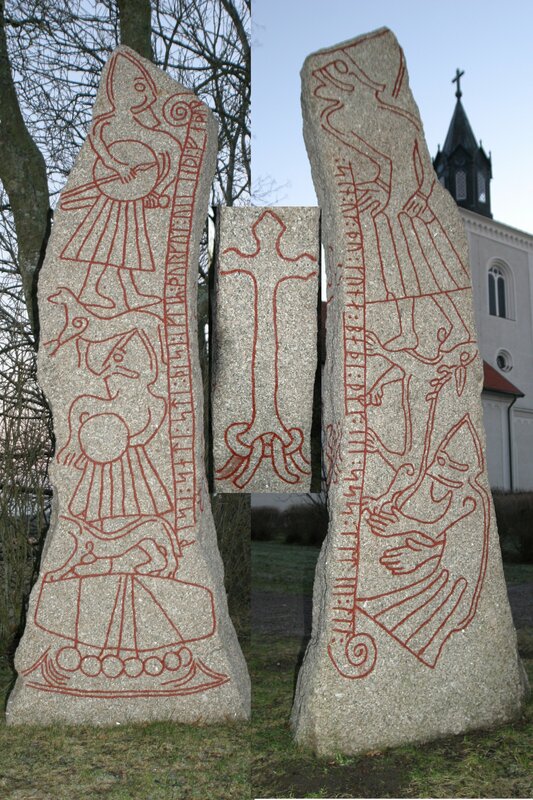 The Ledberg stone is a partially surviving runestone, akin to the Thorwald's Cross It features a figure with his foot at the mouth of a four-legged beast, below which lies a legless, helmeted man, with his arms in a prostrate position One theory suggests that the motif is a depiction of Odin being devoured by the Fenris wolf a Ragnarök or twilight of the gods, the final battle in Norse Mythology, in which several Norse gods meet their death at the end of the Norse World. The battle and death of Odin are described in the poem Vǫluspá from the Poetic Edda. 1. The Etruscan alphabet itself -- like many other ancient alphabets -- bears only a superficial resemblance to the runes. As Etruria was absorbed by Roman Empire, its script was progressively displaced by Latin. Much of the Etruscan alphabet was adapted for use by a number of Alpine tribes at about this time, and these North Italic scripts bear a closer correspondence to the runes -- but only because they also incorporated several Latin characters into their alphabets. Even so, taking all variants of these alphabets together, only 10 of the 24 runes in the futhark conform both in appearance and sound value to characters used in Etruscan or North Italic inscriptions. 2. There was no single "North Italic" script. Rather, there were four main written languages (and some variants) among the Alpine tribes, each with its own alphabet: Raitic, Lepontic, Venetic, and Noric. Not one of these individual languages, however, contained all 10 of the "Etruscan" characters that correspond to particular runes. In fact, the originator of the futhark would have had to be conversant with inscriptions in five different regional languages, combining a few characters of each of them, to arrive at a composite "North Italic/Etruscan" script which could then be used as the foundation of yet another, runic, alphabet. Such a procedure is unprecedented in the history of alphabet development. 3. The futhark was apparently created far away from any Etruscan sphere of influence, at a time when the practice of writing in Etruscan had almost completely disappeared. 4. The original advocate of the Etruscan theory, Carl Marstrander (1928), based his claim on an awl found at Maria-Saalerberg, Austria, dated to the 2nd century BCE, which had been identified as bearing an Etruscan inscription. Marstrander identified the inscribed characters as runes, which he interpreted as "Nefo carved me." Unfortunately, the awl was subsequently established as a modern forgery -- its inscription was neither Etruscan, nor runic, nor 2000 years old. Yet Marstrander's advocacy of the Etruscan theory is still cited in its support down to the present day even though the basis of his argument has been shown to be a hoax. "Regarding the mention of Mediterranean alphabets, Moltke dismissed the Etruscan theory as 'stupid,' pointing out that its first support was sought in the false inscription from Maria Saaler Berg and that in order to create the runes from Etruscan letters the inventor would have had to wander from one Alpine tribe to another, borrowing one rune here and another one there." "The creation of the runic system almost certainly owes something to interaction between Roman and Germanic culture, though the mechanisms at work are subject to much debate. Debate over the runic system’s origins has produced an enormous body of scholarship. 1. The oldest commonly accepted runic inscription is found on a spearhead from Øvre Stabu (Illerup, Norway) and is dated to about CE 175. 2. There is a fibula from Meldorf (in Ditmarschen) dated to around CE 50 that contains what may be a runic inscription, though this is not universally agreed upon. 3. It is often assumed that a system of writing must have been forming for at least a century or so before the earliest surviving examples, so it might be concluded that the runic system was formulated at some point between the beginning of the RIA (c. BCE 50 ) and the time of the Øvre Stabu inscription. It is clear that the runic characters were inspired in part by Mediterranean writing systems—Roman, Greek, North Italic, or possibly some combination of these—but there has been no firm consensus on this point. 4. Certainly it seems likely that the Roman script was the writing system best known to the Germanic peoples during the period when the runic system was developed. Accompanying discussions of the runic system’s graphical origins are arguments concerning its geographical origins Von Friesen’s theory that runes derived from Greek characters looked east to the Gothic territories, while scholars arguing for North Italic origins have pointed towards the Alps. Moltke, who looked to a largely Latin source for the runic characters, suggested a runic origin in Denmark. His argument may not have been wholly uninformed by patriotism, but is lent considerable weight by the fact that virtually all runic inscriptions pre-dating CE 400 are Scandinavian, with only few inscriptions found in northern Germany and the Gothic regions of eastern Europe. 5. Plausible though a southern Scandinavian origin during the ERIA is, it seems unlikely that questions regarding the time and place of the runic system’s origins will ever be universally agreed upon. There is a fair amount of graphic variation in the characters of the Older Fu†ark, yet it must be conceded that they exhibit remarkable uniformity over time considering the evident lack of any institution enforcing the maintenance of orthographic standards in the early Germanic world. When other features, such as the number and ordering of the characters, become discernible, they are also surprisingly uniform. Although the earliest surviving inscription containing the entire fu†ark dates to c. CE400, similarities between the number and ordering of the characters in later fu†ark inscriptions suggests these elements may be of considerable antiquity. 8. in this context, if the Meldorf inscription were not truly runic, it might nevertheless represent a use of Roman characters in the early stages of development into runic characters. 9. Yet it seems likely that whatever process created the runic system was essentially complete by the time of the earliest inscriptions, c. CE 200. Many scholars have attempted to identify a setting in which runes were initially developed. Erik Moltke suggested Danish merchants, while Otto Höfler suggested bands of élite warriors. It is, in fact, most common for a culture’s script to have some kind of magico-religious function alongside its primary secular, utilitarian function. The runic system is unlikely to have been an exception. Much has been made of the word erilaz/erilar which appears on a number of Older Fu†ark inscriptions. The word apparently designated some kind of office, perhaps even that of runemaster. Some have suggested a connection with the Eruli tribe (or tribes), implying that they were famous for their runic skills, or that they had invented runes. There are a great deal of controversies as to exactly what rune lore is. For the sake of clarity, it is helpful to try to establish early on exactly what is not rune lore. Now if the word lore/lawr usually refers to acquired knowledge or wisdom on a subject such as local traditions, handed down by word of mouth in what was once the oral tradition usually transmitted from father to son, mother to daughter in the form of stories or historical anecdotes. In this context, perhaps rune lore must the collective sum of all the orally transmitted historical rune knowledge throughout the ages from the point of origin when runes were first conceived of. Now the only problem with this notion is that the Northern European tribes once used the runes as a living tradition was abruptly ended when the Christian Church decided to outlaw them in Iceland CE 1639. As an example, consider what the kantele meant to the Finnish people? The kantele manifests itself in three separate ways. First, it is a musical instrument, a type of zither which has been known among the Finns and neighbouring cultures for hundreds of years. Second, the kantele is a significant motif of Finnish folklore. It is portrayed as having a supernatural beginning and as an object of magic and power, but it is also referred to as an object in normal reality. Third, the kantele is a symbol of Finnish identity which evokes feelings of pride and solidarity among Finns. These three different ways of viewing the kantele are closely interrelated and together they comprise a concept of what kantele means to the Finnish people. The artwork is meant to represent the Norse goddess Freyja who was born out from a Scandinavian Fjord. Theories abound as to who came first, her brother Frey or the goddess herself Freyja. I much like to believe it was Freyja who came first with her brother Frey following shortly afterwards. We also have to remember that the timeline as we understand linear time does not exactly apply to the Tivar. Note that her dress is dated back to the bronze Age, not the late Iron Age as I strongly feel that Freyja is much older than many are aware of or believe. The Northern Tradition has been, and indeed remains still very much the poor relation of many forms of paganism currently being revived in Britain, especially when we consider the hold that everything “Celtic” has upon the pagan imagination. To write about an even less well-known subject within what is termed the Northern Tradition due to a serious lack of any substantiated Oral Tradition may therefore give rise to some controversy as to who is right about what? There exist unfortunately in Britain today a massive boundary between the real, serious magical groups whose restriction of membership of their order is limited to the more promising and talented individuals. This unfortunately leaves the rest of fragmented British “pagandom” with the same boring undemanding public events run by “ego trippers” who encourage those taking part in these events to imagine that they are actually "involved" in "real magic" without the risk of being frightened by actual contact with the Gods. Another of the problems is that many of those seriously working with the runes have researched their material thoroughly and know it well. As a consequence, is it really that surprising on having reached a higher level of understanding about the runes and of their reputed magical applications, these individuals are seldom willing to communicate it to the lay person at grass roots level. Yet another problem surrounding runic scholars is that they feel that they can only communicate or converse with other rune academics of equally high standing, perhaps believing that those not on an equal footing to themselves are not worth talking to anyway. What you have in essence is that at one end of the scale runic inner lore seems to remain within the jealously guarded framework of self-styled nutty occultist, neo Nazi Armanen Orders or “Black Lodge style” secret societies, most of which have a few self-proclaimed rune experts within their ranks who see them selves as the sole guardians of their faith. What is worrying is that they actually believe in their own delusions and very poor understanding of the elder ways. "Unless a man has the talents to make something of himself, freedom is an irksome burden...We join a mass movement to escape from individual responsibility, or, in the words of an ardent young Nazi, 'to be free from freedom.' It was not sheer hypocrisy when the rank-and-file Nazis declared themselves not guilty of all the enormities they had committed. They considered themselves cheated and maligned when made to shoulder responsibility for obeying orders. Had they not joined the Nazi movement in order to be free from responsibility?" Reflecting at the other end of the scale, many of the remaining elements of Odinic reconstruction groups have tied themselves down with inflexible dogma and sectarianism, content to score points against other perceived rival Northern Tradition groups. We have also to consider the strong personalities, which the Northern Tradition seems to have attracted with the obvious Ego led ”My gang is better than your gang” consequences as a result. The fact remains that an excess of male “born-again” warrior stereotypes tend to dominate the religion and has hampered the revivalism of Odinism in Britain. Drunkenness, grown up males waving swords, spears and mead filled horns in Pub Moots screaming, “Odin!” or “Thor!” can put out the wrong idea to an ever growing Politically Correct general public awareness view about Odinism as a valid religion and is a poor representation of the vast scope of the Northern Tradition in all it’s vast varied forms. This further reinforces the image problem, which the Northern Tradition and Teutonism in general suffers in the eyes of the public Worldwide, that is to say their Nazi associations. Unless this imbalance of machismo is redressed within British Odinism, I fear that the feminine aspect of goddess energy cannot manifest and take the religion forward with certainty. It must be said however; although minor by comparison to male interest that there has been an upsurge of female interest within the Northern Tradition, which I fervently hope, will continue. Neil Stuppel Price is an English archaeologist specialising in the study of Viking Age Scandinavia and the archaeology of shamanism. He is currently a professor in the Department of Archaeology and Ancient History at Uppsala University,Sweden. Modern Neo-Paganism today covers a large variety of polytheistic, shamanistic, and mystical non-monotheistic religions. Its prominence today in the Western World may possibly be the direct result of an increased dissatisfaction stemming by the end of World War 2 with the way the World is going ecologically, spiritually and materially. More and more folks in countries like the United Kingdom, Europe and the United States of America have become disillusioned by mainstream religion and the realization that Judeo Christian values today herald deep rooted wants in materialism rather then spirituality leaving an inherent internal emptiness in the soul of one’s persona. Possibly influenced by the trendy and popular Romantic New Age Movement, a growing interest in medieval or mythical subjects has arisen. These consist of smaller ethnic-centred groups in our midst with a holistic agenda for nature rather than industry or science. But what we understand to be the elder ways or troð (Old Norse meaning faith) has accomplished much good by unifying many folks within the fold of their ancestral ways. However dissention within the modern resurgence of generic Asatru apart from the issue of folkish variants of neo-Nazi racism can also be attributed to the religious agenda´s of other institutions who act against our ways either directly as the Christian Church has done or via a more subtle means, from within and inside existing Asatru (U.S.A) or Odinic (Britain) Organisations? The Christian church attempted several tactics to wash the following of the elder ways from the minds of our northern ancestors by physically destroying any adherance to the Tívar (refers to the Aesir & Vanir gods), as in the case in Norway, with bloody conversions and the destruction of any item or structure that contained any relative ties to the elder beliefs. Also, in later generations, there started a general practice of ‘demonization’ or ‘association’ of the Tívar to suit the ideological beliefs of the new Christian beliefs; in particular examples associating Loki the god of mischief with the Christian antithesis Satan (Hebrew for adversary), and Heimðallr as St. Michael. Some better known modern occultists carry on this tradition as ‘Loki’, ‘Fenrir’, and ‘Midgard’ are given as ‘infernal names’ (of Satan).The Temple of Set regards Oðhinn as the ‘Gothic God of Darkness’ and has pylons that are identified with the name of Loki.Each of these examples utilises the perception of archetypal personifications and relegate Tívar to that which they want to shape them in order to promulgate their own narcissistic delusions, and not to honour the Gods and Goddesses in their might and main. Ref: Crowley, Aleister], 'The Present Crisis in Freemasonry', The English Review, xxxv (August 1922), p 133.